Colin was somewhere out along the craggy, knife-edged ridge that leads to the peak of Mount D’Iberville. The weather had worsened over the last half hour, and I watched uneasily as the moist air gathered and rushed up the steep slope on the north side, going at what looked like 50 or 60 clicks an hour. I wouldn’t learn of it until later, but ice was forming on the ropes Colin and Ned and their guide Bjarne were using to get to the summit, and the wind gusting over my head was catching them as they traversed ridges with thousand-foot drops, sometimes on both sides at once. The temperature was hovering near zero Celsius, and the conditions weren’t great for either climbing or sitting still and fretting. I had been secretly relieved that Colin had wanted to go to the top and to hear there just wasn’t enough time for all of us to summit and get back down safely. Instead, I could stay where I was, on that narrow piece of rock, low to the ground and shielded from the unrelenting wind, quietly overwhelmed by the vastness that stretched out below in every direction. We were about a thousand miles north of Montreal, in the Torngat Mountains that run right along the Quebec-Labrador border. 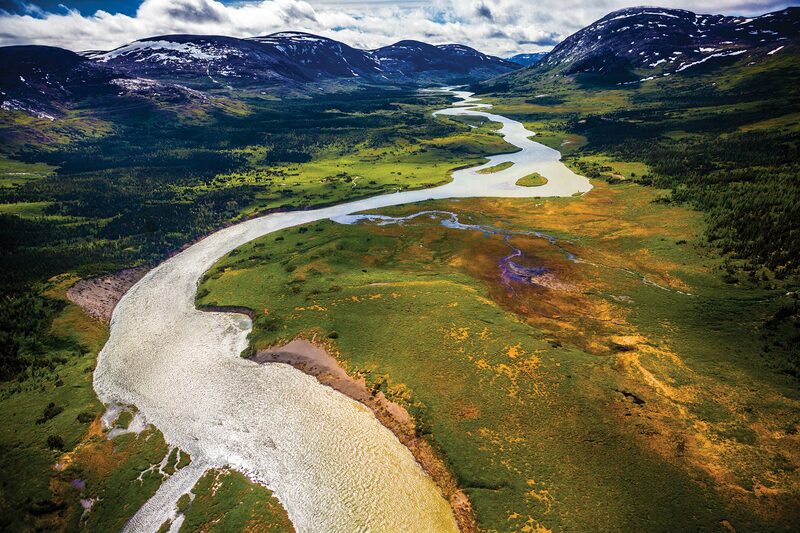 And much nearer to the beginning than end of an expedition that would take us from the opening of the Koroc River near the Labrador Sea, to the peak of Mount D’Iberville, then 160 kilometres downriver to Ungava Bay. We would be helped along the route by expert local Inuit and Quebec guides and by one another—and we would need lots of it to meet the challenge of moving over a rugged and wild landscape that is every bit as forbidding as it is beautiful. And as we made our way down the valley, first over tundra, then through a narrow band of boreal forest and eventually onto the river itself as it widened and headed out to sea, it seemed to me that grasping anything about the people who live here today, or their forebears, would be almost impossible without first feeling the cold and the wind—without contending with the environment even for a short time—and without glimpsing how much struggle and loss must inevitably have been a part of life north of the 55th parallel. Even as the region strives to promote ecotourism as a viable source of income today, many of the Inuit of Northern Quebec and Labrador still recall a time when they did not live in permanent communities, and instead were constantly on the move in search of enough food to sustain them. Until the early 1960s, the Inuit of George River (known also as Kangiqsualujjuaq, but renamed by Moravian missionaries in the early 1800s) were constantly on the move up and down the rugged coast, and back and forth across Nunavik to the Labrador coast, often via the Koroc River valley. Outpost’s photographer on the banks of the Koroc, near where it reaches Ungava Bay. In the little community of George River, we met Inuit elders Suzie Morgan and Bobby Snowball, though how “elder” they are was not discussed, and Inuit often don’t look their age. There’s no doubt these people are rugged, though. Suzie told us about a trip her family took overland from the mouth of the Koroc River to the Labrador coast in the 1960s, which her mother had financed by selling fish to the George River co-op. The family had set off into the wilderness that lies mostly above the treeline, with one rifle and no more than five or six bullets for the entire trip. Snowball, who could be anywhere between 50 and 70 years old, sounds like a man who is incapable of overstatement. The Inuit are fiercely proud of their heritage and their ability to live on the land, and my guess is they are glad to see people come here to experience life on the Nunavik tundra, if only to gain some understanding of what it took for the people to have survived and built and sustained a culture here for so long. Life in even the largest communities in Nunavik would seem a little mad, too, no matter how tempting the natural beauty. Everywhere I looked I saw ruggedness. 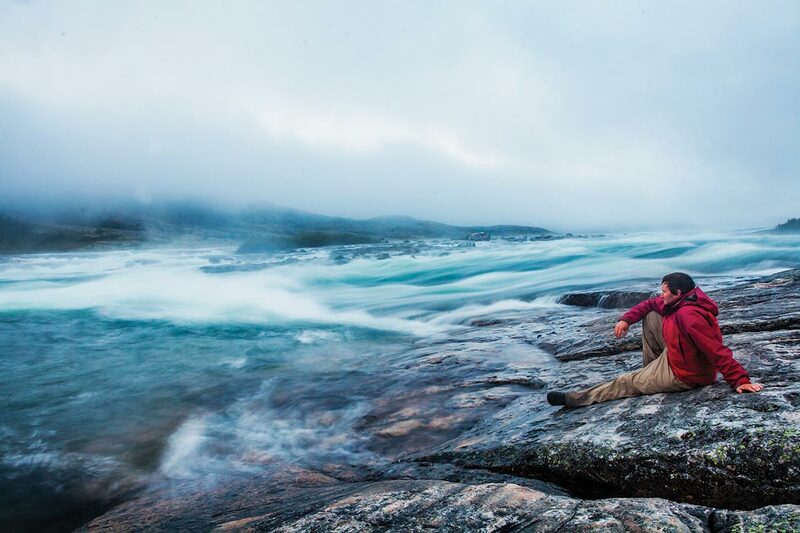 The waters of Ungava Bay are frigid, even in summer, and just may have the largest tidal range on the planet, not to mention dangerous currents, steep shorelines and no one to help for hundreds of kilometres if you get in trouble. Yet even today, it’s common for whole Inuit families to head onto the bay’s icy waters in open canoes for day-long excursions in search of clams or to fish for char or to get to a caribou hunt. Polar bears are common on the coast, but more and more they’re being encountered in the park inland. France Brind’amour of Nunavik Parks told me she ran into one on the way up to D’Iberville, probably 40 kilometres from the coast. The engines on the Air Inuit Twin Otter were whining as they warmed up on the runway in George River, about 200 kilometres up the east coast of Ungava Bay. We had flown in from Kuujjuaq, the largest community in Nunavik with a population of 2,400, two days before, and had spent our time going over the route and packing our gear, anxious to hit the ground and start walking. I looked over at Bill Roberts, a veteran of countless flights in small planes heading to small airports. He smiles reassuringly and turns back to the window just as our pilots released the brakes. In an instant we were hurtling down the runway, the lift increasing with each second, as the plane shook like an animal that needed to get airborne. The Otter seemed to inhale and then rose up in an instant, giving us the sensation of weightlessness, just as the noise of the engines was swept away in our wake. It was a great moment: after months of planning we were finally on our way to Kuururjuaq National Park, a remote and rugged area that can be challenging just to get to. 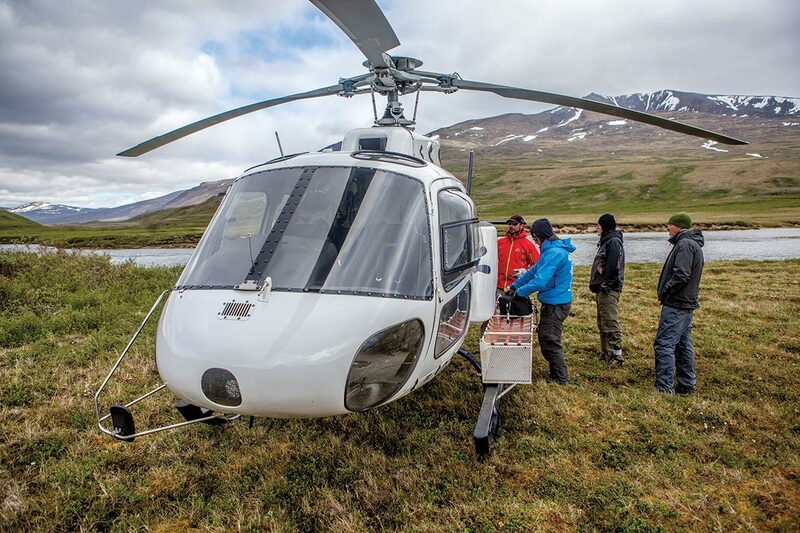 As we gained altitude, I could see the glittering waters of Ungava Bay receding behind us to the west, and after a few minutes of flying over low rugged hills dotted with pockets of snow, the Koroc appeared and we turned and headed upriver. The only sign of humanity below was the shadow of our plane moving over the landscape like a ghost. Our Air Inuit pilot, Dominic Gosselin, rolled the plane gently left and right to allow Colin and Will the chance to get a good shot of the lush valley below us, so saturated in light that it almost looked surreal. Kuururjuaq National Park is one of a series of large parks that have been established, or are in the works, north of the 55th parallel. Nunavik, meaning “great land,” is home to approximately 10,000 Inuit who live in 14 communities spread out over a staggering 443,000 square kilometres—which amounts to a third of Quebec’s land mass. Until 1912, the region was part of the District of Ungava of the Northwest Territories. The communities here are growing, and the focus is on ensuring that young Inuit have more and better jobs, and more reasons to stay in the north. Everywhere we looked in Kuujjuaq and George River, we saw lots of smiling kids. The Koroc snaked east, narrowing and changing colours, as we flew over a narrow band of Boreal forest stretching as little as half a kilometre to the south, and just a short distance to the north, where the hills looked too steep to sustain trees of any size at all. We flew low over the forest in the centre of the valley, a dense-looking stand of black spruce and larch on a deep green carpet, surrounded by an expanse of tundra and rolling, rocky terrain. On either side, glacier-fed rivers and streams tumbled over huge rocks down into the Koroc. Colin was smiling ear to ear. He had been to this part of the world almost 10 years earlier, and the land and the people here had made a deep impression on him. That time he was by himself—dropped off on the edge of a bay on the Labrador side, where at least one polar bear was swimming circles. He had been told to just get up high and he’d probably be alright. People tend to be matter of fact in Nunavik about the risks we think of as extraordinary. On the north side of the river I spotted a black bear, who must have heard the Otter screaming up the valley a thousand feet above his head. He was at a full gallop, all shiny and fat and healthy looking, his front legs reaching back behind him as he tore uphill over rough terrain without missing a step, then disappearing behind a ridge. That was the first of many bears we would see over the next 10 days in the valley, where they graze like cattle and are content to remain at a distance. The sun sets over the Koroc River as Will, Paul and Guillame look on. As the valley and the river narrowed, the mountains grew larger and we could see the Torngat range stretching north and south along the Labrador border. Dominic edged the Otter to the north, and the jagged ridges leading to the summit of Mount D’Iberville came into view, each looking as steep and dangerous as the others. Even on a sunny day in summer the wind was blowing snow and creating a vapour trail as it rushed over the snow-dotted peaks. I recognized the Koroc ridge, which would be our route toward the summit—and even from a safe distance I got queasy looking at its approach. I had read about the climbers lost on D’Iberville in 2003, and we knew that even in July or August it can dangerous. Mount D’Iberville, known as Mount Caubvick in Newfoundland and Labrador, is part of the Selamiut Range that runs between Nachvak Fjord to the north and the Koroc River, and is bound by the Palmer River on the west. “Selamiut” is Inuktitut for sky dweller, and “Torngat,” I am told, means “place of the spirits.” A few days later, as I sat near the summit of Mount D’Iberville, listening to the wind moving over the mountains and whistling down the valley, I got a glimpse of what a place like this must mean to people who still have a night sky to wonder at, who often see spirits moving across the land. But now, the Otter turned and dropped over the shoulder of a ridge on the north side of the Koroc River, and a long, flat sandbar came into view. The landing strip is a path on the sandbar that has mostly been cleared of larger rocks, and those that remain can only be seen when you’re already safely on the ground. Yet our landing was smooth, and a few minutes later we were unloading our gear. The wind moving down the valley brought some relief from the bugs, which had harassed us mercilessly at George River. Here, it was all light and wind and sun, surrounded by mountains near the headwaters of the Koroc, 160 kilometres from Ungava Bay. When for an instant the wind subsided, the stillness and space were almost overwhelming. The Outpost team was comprised of four, and included me, photographer and outdoorsman Colin O’Connor, Bill Roberts, a veteran traveller and alpinist who probably should write at least one book, and Will Allen, videographer and expeditioner extraordinaire. The camera guys were carrying big loads but did it all without complaint—just kept shooting, even when just keeping feet trekking over the uneven ground, just keeping upright when the weight of your pack shifted suddenly, took everything you had. None of us had hiked or worked together before, but the group seemed to gel without much effort and functioned well, despite problems with gear, injuries and bad weather that dogged us most of the way down the valley, all of which served to remind us not to take this place lightly. Indeed, on our way out of the park we learned of a group on the Labrador side that had declined a bear guard (an armed Inuit guide), only to have one in their group dragged from his tent by a polar bear (he survived). At the beginning of our trip, higher up the valley, we were joined by two Inuit guides, Sandy and Ned Annanack, and our climbing guide from Attitude Montagne, Bjarne Baek. Sandy and Ned shared a .308 rifle and a tent, and lots of laughs with us over the next few days. Local knowledge of the land is hard-won, and young men like Sandy and Ned all seem to have hugely entertaining stories of misadventure on the George and Koroc rivers, or on Ungava Bay, or anywhere else they venture—entertaining because they have happy endings. Ned (Neekallak, for long) told us of having a snowmobile crash through the ice one spring more than a hundred kilometres upriver, with little more than a rifle and the clothes he and his uncle had on. Without a satellite phone or anything else, there was nothing to do but get as dry as possible and start walking and hope someone came looking for them. And walk is exactly what they did—for two days straight, with ice forming on the caribou soles of their boots, poorly equipped but shooting ptarmigan along the way, sleeping for just a few hours at a time. Ned grinned as he recounted the story: “I was glad when we heard the snowmobile coming to get us.” These events, I noticed during our trek, no matter how nerve-wracking they must have been, are described without embellishment or dramatic flair, and I wondered if this is part of that sense of perspective that life in the North demands. Sandy and Ned were a little aloof at the beginning, and the ease with which they moved across the land gave them lots of opportunity to get ahead of us, where they would sit down on a ridge and wait and watch as we approached, both looking for caribou or bear, completely at ease out on the tundra. The day before our ascent of D’Iberville, we arose early. We had a long walk up the valley in front of us, and we would soon learn how well our gear and our bodies were performing. Bjarne and Sandy laid out the climbing gear, including harnesses, helmets, ropes and a variety of carabineers. The clear skies from the day before were gone, and by the time we’d packed up we could hear peals of thunder moving in our direction, sounding for all the world like cannon fire, as the wind rumbled up the valley accompanied by the concussive force of a giant drum. Within minutes the skies opened up and the rain started, coming down in sheets, blown back and forth by the gusting wind. “Welcome to the North,” I said, mostly under my breath—but truth be told, it was invigorating. We waited until the first shower passed over us and then headed down, off the landing strip to cross an arm of the Koroc River, which was cold but thankfully only knee-deep, and headed west as the rain lashed us intermittently. It wasn’t too cold though, and the effort of moving under heavy packs made overheating and sweating the issue to guard against. After a time we started to climb, heading north and away from the river and up a broad valley, at the top of which the base camp is located—just a prefabricated igloo-like structure sitting on a platform, a work of man that looked like a speck compared to the majestic mountains around it. As we came over a shoulder and got our first look at the valley, the scale was overwhelming—we were actually now standing at the bottom of a flat, broad valley of rock and moss bounded by mountains that swept upwards from the valley floor for thousands of feet more and more steeply, before flattening out and hugging the ground, one next to the other, as if lying in wait. Bjarne had a dual mission on this (his third) trip into Kuururjuaq National Park: he was to do his best to get at least one of us safely to the summit of D’Iberville and back—with the emphasis on safely—then spend a few days with us exploring some lesser-known valleys and mountains in the area. 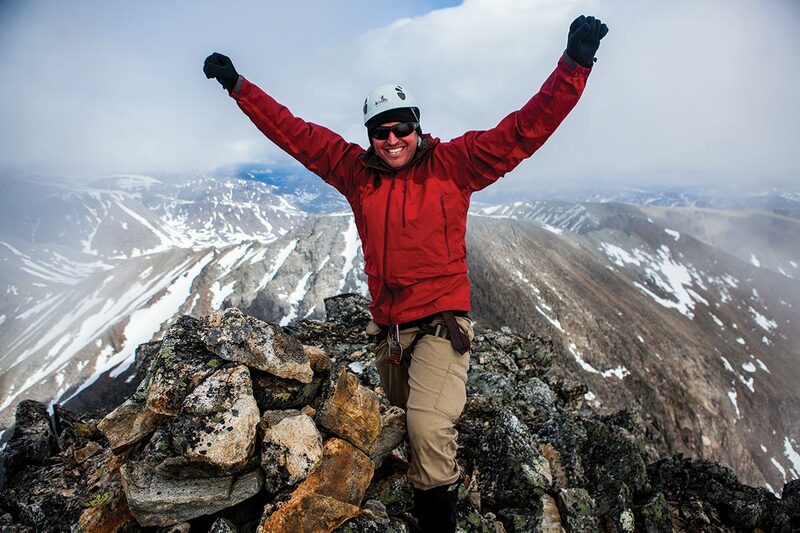 Bjarne is 31 years old, and made his way to British Columbia from the west coast of Denmark in his early twenties; since then, he has built an impressive resume as an all-season climber and guide. He has the lean athleticism of someone who might just adhere to something without trying, and a steady seriousness that is indispensable in challenging environments. It had taken a long time to get to the trekking summit (which is not the mountain’s summit) after hours of climbing straight up over talus and scree, though we stopped frequently to get our breath or to gaze back down the valley leading south to the Koroc River, where we had landed just a few days before. Team Outpost heading up toward Mount D’Iberville. Every time we stopped and pivoted to look out over the valley, the view got better and better, and every time I would think, “This was why I came here”—to see a part of the planet that is the way it has always been, that has the power to restore a missing sense of perspective. The air and light and mountains render you a speck on the landscape, and the wind seems a constant reminder that it will howl whether you are there or not. I had mixed feelings about the summit before I’d even left the valley floor. After dinner the night before, Bjarne had asked us about our expectations. A few of us felt that getting to the summit was important; me, not so much. I had studied photographs of it, and read about the ridges leading to it and about the couple who had lost their lives on it in 2003, all of which made me uneasy. I tried to sound casual: “It’s not that important to me.” Colin just grinned. It took me awhile to figure out that he was just happy to be here, and would go pretty much anywhere someone suggested. He would climb, scramble, hike and crawl as much or as high as he had to, so long as he could fish at some point. When we reached the trekking summit, it was already one o’clock. Bjarne’s turnaround time to head back down the mountain was 5 p.m., if the weather was good. We would have good light until about 9:30 p.m. or so, but the climb down would in some ways be as difficult as the climb up. We rested for a while, chewing energy bars and nuts. After a few minutes, Bjarne looked at his watch, then out to the void as if gauging the weather, and then at his watch again. “I can’t take three of you, and there isn’t time for two trips there and back,” he said. Bill and I looked at each other. We knew both Sandy and Ned wanted badly to get to the top, and it didn’t take long for us to decide that one Outpost team member and one of our Inuit guides would go with Bjarne. Colin was the logical choice—he’s a photographer and was in the best shape. And off they went, accompanied by Ned, first descending from the trekking summit gingerly, and then only appearing intermittently over the next hour and a half. I later heard from Bjarne that out on the ridge, near the Koroc step, he became concerned about the cold and the wind. 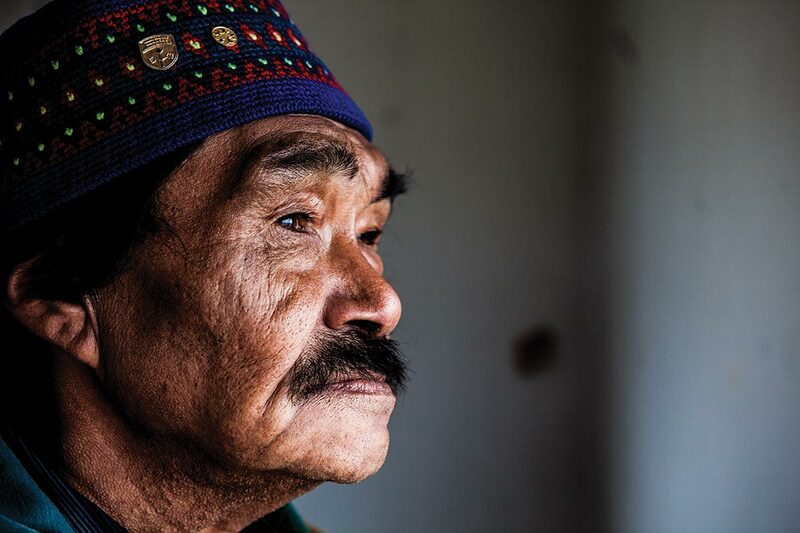 He told me they were stopped on a ridge at one point, getting ready to continue the push for the summit, when he saw Ned hunched over squatting down against the rocks, as though hiding in the hood of his jacket. The wind was howling, so Bjarne reached out and touched Ned’s shoulder, concerned he was struggling with the conditions. Only 90 minutes after leaving the trekking summit, the group reached the top of Mount D’Iberville. Most of the effort had been a rugged upwards trek, with a bit of technical climbing nearer to the top. Photographs were taken and congratulations exchanged, and Colin stood atop with arms outstretched, laughing into the wind. Atop Mount D’Iberville, with Labrador in the background. Sandy had wanted to get to the top, but there just hadn’t been enough time. When we saw Ned and Sandy downriver about five days later, we learned that Sandy had made it to the summit a few days after our ascent and that Ned had gone back up with him! When we got some food into us back at base camp, we realized we’d been gone for about 12 hours, most of it either climbing up or picking our way gingerly down the football fields of talus, scree and boulders. We had endured, but the cold and the ever-present wind had left us exhausted and with nothing in the tank. Each of us was asking the others how they felt, in part to be reassured about our own level of fatigue, but also to ensure everyone was being candid about how they were feeling physically. We’d only been out here two days, but they’d been long and hard days, and tomorrow we were to start the trek out of the valley and down to the Koroc River, where we’d turn west and head toward Ungava Bay. We had our work cut out for us. Looking at the Koroc valley from the air can be deceiving. What appears to be a smooth green carpet and relatively flat ground turns out to be difficult and varied terrain, often covered in shrubs and willows that create a tangled mess underfoot, and that is punctuated by bogs and rocky, slippery ground. Our first couple of days walking along the north shore of the river were an education on getting around without a trail system. When you have to think about every step, every step takes more energy, and what looks like easy crossings from the air or on a map often turn out to be fast-moving streams at the bottom of slopes covered in willows—sometimes it took 20 minutes or more to cover just a hundred metres of distance. Paul and WIll gearing up at Korluktuk Falls. We had hoped to cover 15 kilometres a day on average, but even when the going was good it was a long day. Bill, probably the most experienced of trekkers and climbers on Team Outpost, has written about the differences between tracing a path on a topographical map and then putting one foot in front of the other on the ground—over and over during the course of our trek along the Koroc River, we were reminded of that humbling reality. The weather didn’t cooperate for the most part either, with rain on all but two or three of the days we were in the valley. After the second day heading downriver, most of us were down to one set of dry clothes reserved for sleeping. Eventually, to increase our pace, we stopped taking off our hiking boots before crossing streams, and just crashed on through, resigned to a certain amount of discomfort as the price of admission. As we walked we fell into a trance-like state, where one foot goes in front of the other, even though it hurts, even though every part of you wants to rest. You keep walking because that’s what everyone else is doing, and because walking is the only way to get where you’re going. The rain fell and the wind came and went, as did the bugs, the sun and the clouds. Bears appeared on the far shore, small specks halfway up mountainsides, before meandering away, out of view behind ridgelines that couldn’t be discerned because of the distance. A family of Arctic wolves moved high above us for a time, stopping occasionally to keep an eye on our slow progress. On our fourth day walking west along the river, we spotted a black bear about a kilometre or more downhill and downwind. He was a long way away, but we decided to move up the hill to give him extra space. But as we moved at an angle up the ridge he heard us or caught our scent, and started ambling in our general direction. I hadn’t expected that; still, he was a long way away so we just kept moving. I was keeping a wary eye on him when I suddenly noticed that he’d quickened his pace—as if he’d just punched the gas pedal on a car—and wheeled in our direction. Now he was about 500 metres or so away, still downhill, and my pulse quickened along with his stride. I didn’t have to ask Colin if he’d noticed the change, too. “I think he’s just curious,” Colin said, almost hopefully. Ever the Irish optimist, I thought, and no sooner had I thought it than our big hirsute friend broke into an all-out sprint in our direction, eating up the ground between us like he was on a racetrack. Now the distance was 200 metres, and it was plain he was more than a little curious. “Get up on those rocks!” Colin was directing traffic, and I was grateful. We went uphill and were now standing on some large boulders in an effort to look more formidable—exactly the opposite of what we felt. It reminded me of going to bars when I was younger, and the stakes felt just as high! The bear came to a stop about 50 or 60 metres away. He was easily more than 300 pounds. He didn’t look to me like he was breathing hard after a 150-metre sprint uphill, and that was disconcerting. If you’re going to have a problem with a bear, it’s better if it’s a deconditioned bear, one used to a sedentary lifestyle. Colin suggested that maybe he should get out his camera. I told him I thought his priorities were skewed. “Stock photographs of bears are always better,” I said, but Colin just frowned. I admired his commitment to the job, but felt we should be focused on deploying bear bangers, and maybe even spray, if we found ourselves at closer quarters with our curious friend. The bear banger worked exactly as it was supposed to—except that the bear reacted as though he was stone deaf. Like a miniature rocket-propelled grenade it snaked out of the dispenser and took a slightly wavy path on its way downhill, where it exploded with fairly dramatic force about five metres in front of the bear’s face. He stared at us as if he wasn’t sure what he was supposed to do. The standoff continued for another minute or so, until finally he seemed to realize we were more trouble than we were worth. Air service ensures your time in Nunavik is safe. He started moving to his left, and we started moving gingerly down the hill to ours, each keeping a distrustful eye on the other, until he meandered out of sight behind a low ridge. Although now out of sight, he still could’ve been as little as 30 metres away, and I was still deeply unamused. A few minutes later we scrambled down into a draw, one at a time, while keeping an eye on the ridge, and when we finally got up onto the other side, we could see the bear still moving in the other direction; only then did we start to breathe easy! We took a break on a rocky perch and ate our lunch. Another bear, this one with cubs, was visible down near the river. You will see black bears on the shores of the Koroc, that’s for sure. We kept our eyes on her as we ate our trail mix and chocolate, and discussed how the nearest people were probably down at Korluktok Falls, at least two days walking from where we were. That’s where we were headed, and by now we knew that tracing a route with your finger on a map is one thing, moving 15 or 20 kilometres a day over rugged terrain quite another. After three days of walking, we camped on the edge of a massive field of rough stones and moss that looked to me like a scene out of Braveheart. We were tired and nursing minor strains and managing problems with our gear—and that’s when the rain really started to fall. And it just kept on falling for the next 15 hours, as we huddled in our tents and listened as the wind pushed the rain down the valley and kept hurling it onto the ridge. Every time it seemed to abate a little, the wind would pick up and the volume of rain would increase with it. The temperature continued to drop as well, and we agreed we were better off waiting it out, rather than trying to trek in wet clothes (almost everything was wet by this point). And so we waited, until finally at about 11 a.m. the next day, seven hours after there was enough light to walk, we packed up camp and started to move west. Finally we made it to Korluktok Falls, now about a week after we’d set out from the sandbar in the direction of Mount D’Iberville. The airstrip is located in a narrow valley in the boreal stretch that winds its way back and forth across the river, roughly midway between George River and the Torngat Mountains. The airstrip itself is just a mowed patch of grass that jogs noticeably to the side about halfway down its length. Nunavik Parks is building a visitors center deep in the park, where there will be sleeping accommodations for those travelling on the river in summer by canoe or raft, and for backcountry skiers in the winter. At the airstrip we meet Guillaume Lafleur of ABV Kayak & Excursions. “Glad you guys made it,” he said with a smile, while looking us over. I guess after seven days on the tundra we looked like a pretty ragged crew. The final phase of our expedition was a long portage by raft and kayak down the Koroc River. Ironically, the idea was to head back to the town of George River on Ungava Bay, which was both our launch and end destination. 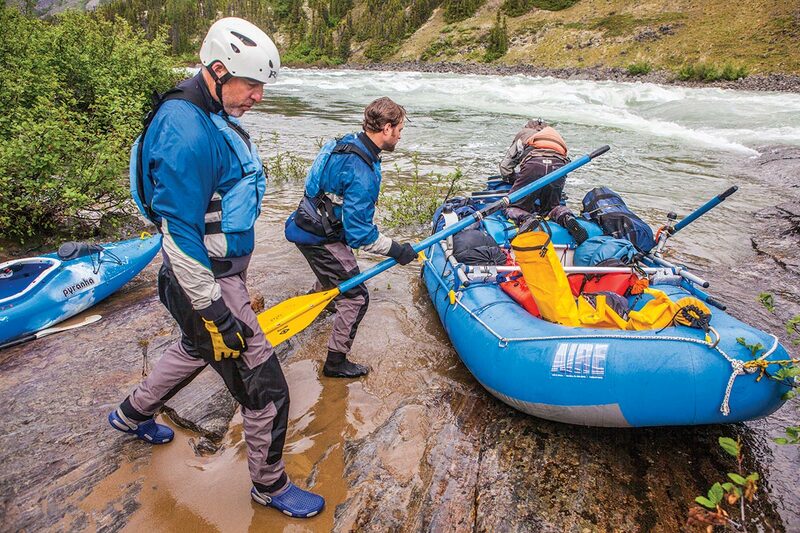 Most of us would raft, but Will would spend part of the journey following behind in kayak. The next morning we set out, portaging down and around the Korluktok Falls, now swollen by the recent rain and roaring so loudly I couldn’t hear myself think. The portage itself was hard work, but the prospect of paddling rather than trekking had us motivated and energized. We were as enthusiastic to get going down the river as we had been to get up D’Iberville just a week before. Over the next few days, it became clear why the Koroc River is such a draw for whitewater adventurers. With the benefit of Guillaume’s steady guidance, we crashed through a series of Class III and IV rapids, still framed by dramatic mountains that most of us would never associate with Northern Quebec. The river widened the closer we got to Ungava Bay, and as we travelled downriver we could soon see how clear the Koroc really was. The sand and silt that had washed into the river during the recent heavy rains had settled, and we could see bottom at 10 or even 15 feet down. At one point we were back on the north side of the line again, where the landscape on both sides of the river is rocky and barren. If we were travelling overland and not on the water we’d be heading into a space that offers no protection from the wind and the cold—up on the ridges and hills here I imagine it would feel like you’re walking on top of a topographical map, with each fold and rise and undulation laid bare at your feet. Guillame on the Koroc, Arctic char in hand. Each of us took over on the main oars for periods of time, but most of the heavy rowing was done by Guillaume, who is as strong as he is good-natured. Guillaume now winters in Ottawa, where he’s studying to be a paramedic, but with every word he spoke over our four days on the river it became clear that he belongs in the backcountry. At one point we stopped paddling and just let the raft do a slow 360-degree turn, and all we could hear was the breeze. The silence itself was breathtaking, and I can’t recall ever being in a quieter place. We had all become less talkative as we’d moved down the valley, partly due to fatigue, but also because the place itself has this gravity about it that commands reverence—sometimes by its stillness, at others by its noise and fury. On our last day of paddling we covered about 38 kilometres, and as we approached the mouth of the Koroc, we saw our first seagull and smelled the salt of Ungava Bay. The weather improved, too, and the broad shallow portions of the river were dark blue, with ripples of white stirred up by the breeze. The last portage took us over a rocky trail toward the mouth of the river, where it meets the bay in a torrent of turquoise water and foaming rapids that crash around huge rocks. 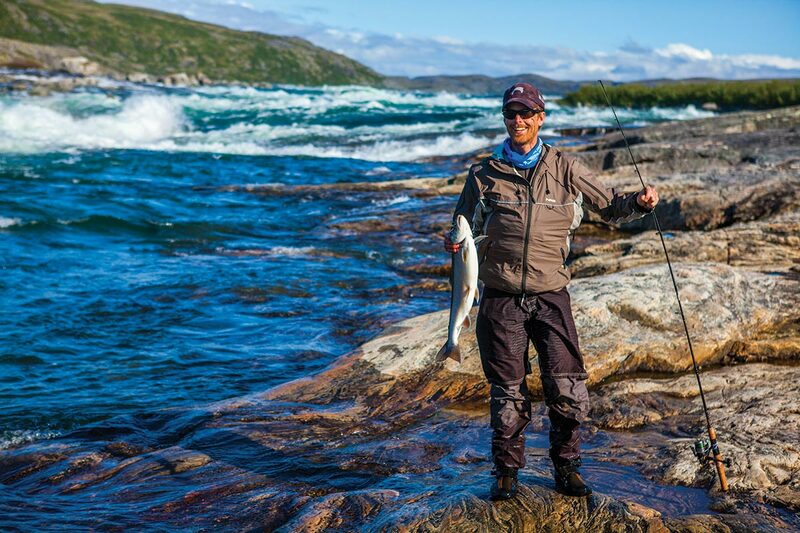 We pitched our tents and got down to the water as soon as we could—it was time to fish, and it wasn’t long before we had four large Arctic char ready for the rocks. Guillaume and Colin gutted and cleaned them, and two were in the frying pan within minutes. There just aren’t words to describe the taste of the freshest, salmon-like Arctic char possible. I awoke the next morning to the sound of someone unzipping my tent fly. I looked up, slightly startled and unsure of where I was. A solidly built man in camouflage gear with a wind-burnished face was peering in at me. His teeth were too white and frankly too close. I didn’t know who he was, but he certainly looked healthy. I also saw he had a rifle in his hand and looked amused. “Time to wake up,” he said, smiling. Daniel Annanack, his son Jacko and nephew David had all come by boat over Ungava Bay, and it was David who was giving me my wake-up call. By 11 a.m. we had carried our gear and the raft around the point, and ferried it over to Daniel’s boat, a 23-foot aluminum beast with twin 150s on the back. We laughed and talked and ate morning char while we readied to go. We took a last look up the Koroc River, white and loud as it emptied into Ungava Bay, until Daniel wheeled around and we headed out into the deeper water of the bay. The day was hazy and cool, the sun more a vague white sphere mostly obscured by cloud and fog. Nonetheless, the bay and the rocky shoreline to the east was beautiful, and the water calm enough to make good progress toward George River. About 20 minutes out, we saw large canoes and other boats heading north. Daniel explained that everyone was on their way to get clams. And so they were—in open canoes out on Ungava Bay, wrapped up against the cold and the damp, just to fetch clams. We saw Bobby Snowball and Suzie Morgan, both smiling and seeming to enjoy the ride and the light and the air that fills their world. As we finally made our way into the harbour at George River, I was glad to be back and looking forward to the creature comforts of home. 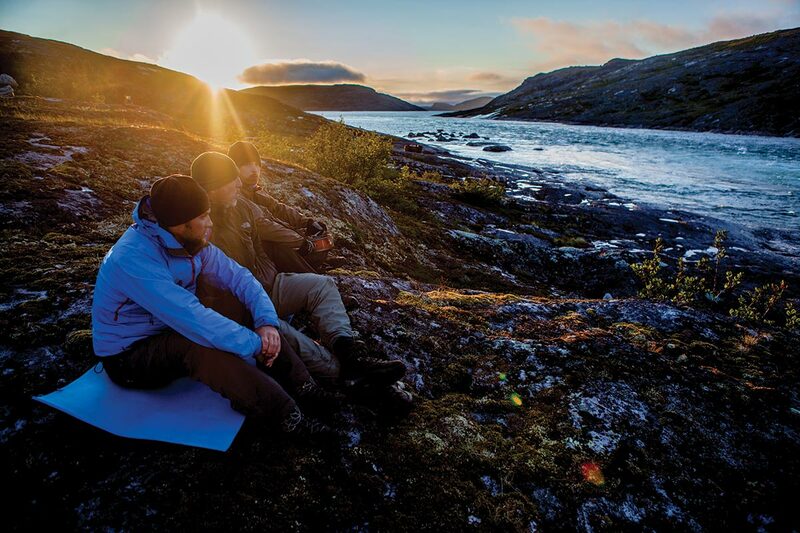 But I knew that our expedition around and down Nunavik’s mighty Koroc River had been much more than just beautiful and memorable: it had taught me to be grateful for the immeasurable things, above all else. 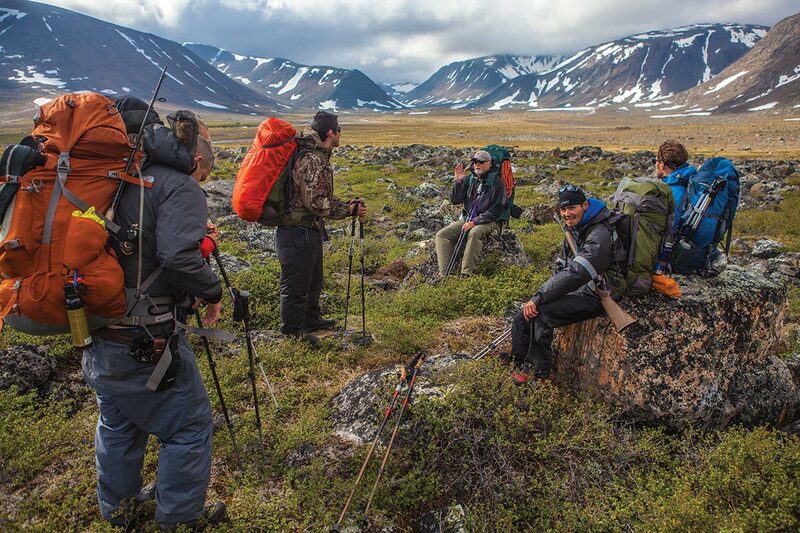 Team Outpost, lead by Gear Editor Paul Auerbach, spent two weeks in Nunavik, Quebec, gorging on fresh Arctic char, and trekking and wild camping on the stunning Kuururjuaq tundra. Our story was published in the 2014 Global Travel Guide. Is there any way to travel with a newborn?